Albert Einstein once said "When you are courting a nice girl an hour seems like a second. When you sit on a red-hot cinder a second seems like an hour. That's relativity." In triathlon terms, the Nepean Triathlon is relatively short, however for me, it was to be the longest I had raced in my fledgling foray into the sport. It composed of a 1km swim, 30km bike and 10km run. The race is the oldest triathlon in Australia and boasts quite an honour roll including Pete Jacobs, Barbara Riveros, Brendan Sexton, Tim Reed, Courtney Atkinson and Aaron Royle. For someone like myself, who has developed quite a penchant for the history of the sport, this adds a little extra significance. It was also a rare opportunity to race on the same course as the pro athletes, at the same time. The water temperature was a soup-like 23.5 degrees and, as a result, the swim was a no-wetsuit affair. This is not something I am daunted by but a definite slowing agent. I did my best impersonation of a freeze block with arms and meandered my way over the three-turn, one kilometre course in a tick over 22 minutes. I have no doubt that this is the area that i have infinite scope for improvement and my weakest leg by far. 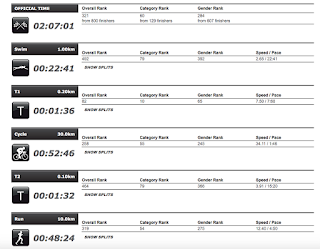 I kept my time in T1 to a minimum and was in and out in 1:36 10th overall in my category of 129 competitors. Overall results from my Nepean Triathlon debut. The bike was a fast, mostly flat course which I enjoyed. I traversed the 30km in 52:46 at a bit over 34km/hr. 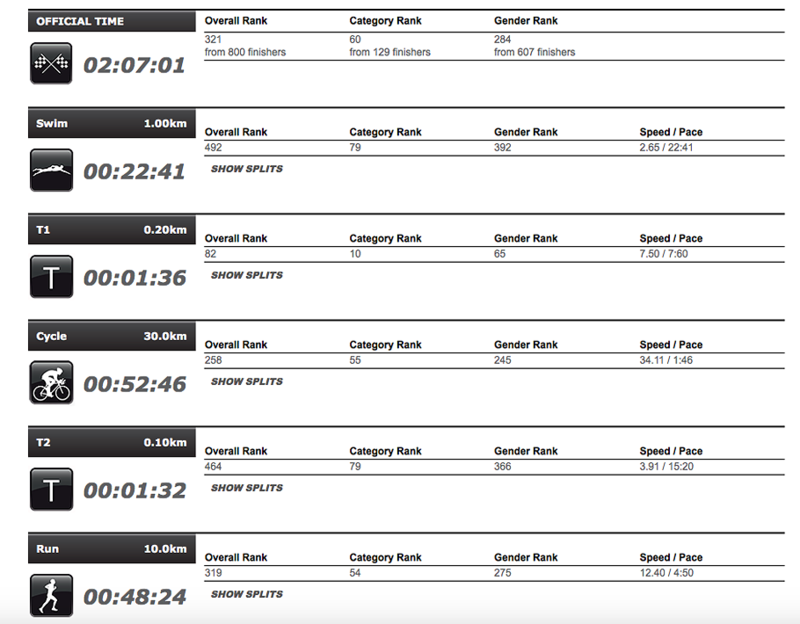 That was enough to see me 55th in my category. T2 was a little slower but i was off the pushy and out on a 10km jaunt to complete the trilogy. The first 3km went fairly well, working hard on cadence and staying relaxed. The 4th kilometre I felt like the world was ending; concrete legs, heavy breathing, the whole kit and caboodle. A short refresher at an aid station allowed me to find some rhythm. By the time the final two kilometres rolled around, I felt as strong as I had all run and was able to finish reasonably well, stopping the clock at 48:24 (my second best effort over 10km to date). I completed the course in 2:07:01which was somewhere around the time I had estimated, if not slightly quicker. I placed 60th in my category of 129 competitors. Two things I learned from the outcome were that I have a long way to go in terms of improving and that I am definitely keen for a move to Olympic distance racing next season. My next race will be a sprint in two weeks time in the northern coastal town of Forster, another location rich in triathlon history. The week leading up to this will coincide with me beginning a training program with Project M Training. This will be a lot of fun and a lot of hard work and should yield plenty of improvements.